Scar tissue maturation process occurs stepwise, and calls for reliable classification. The structure of collagen imaged by nonlinear optical microscopy (NLOM) in post-burn hypertrophic, mature scar, and normal skin biopsies, appeared to distinguish these maturation steps. However, it was a discrimination analysis, demonstrated here, that automated and quantified the scar tissue maturation process. The achieved scar classification accuracy was as high as 96%. The combination of NLOM and discrimination analysis is believed to be instrumental in gaining insight into the scar formation, for express diagnosis of scar and surgery planning . 1. Kelf TA, Gosnell M, Sandnes B, Guller AE, Shekhter AB, Zvyagin AV: Scar tissue classification using nonlinear optical microscopy and discriminant analysis. Journal of Biophotonics 2012, 5:159-167. Figure. 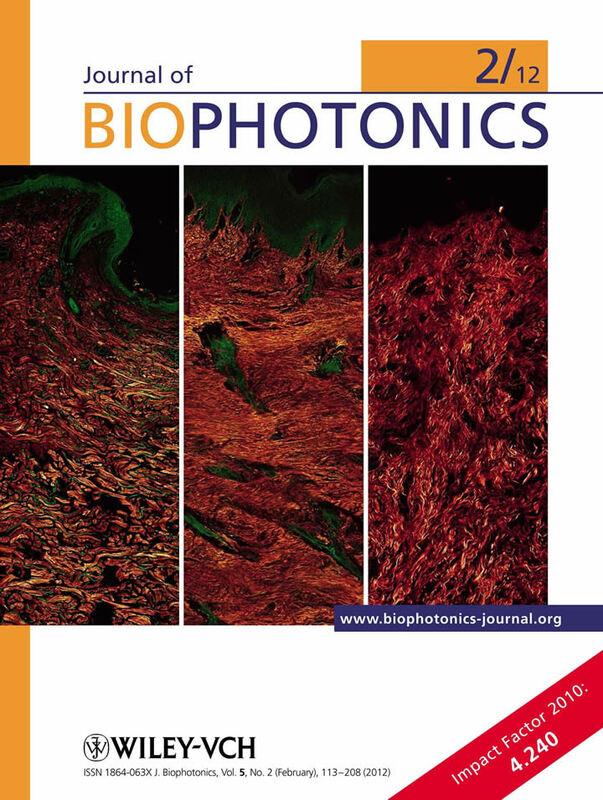 Journal of Biophotonics cover showing three types of collagen architecture in (left to right) normal skin, hypertrophic and mature scar tissue.